Today I have some easy Easter and spring nail looks for you, I was asked recently if I could come up with some easy nail art looks for Easter and the spring and summer so a few days ago I decided to find some of my more pastel shades of nail polish and see what I could come up with, and this is what I created. Five different looks, one is specifically Easter themed but the other four are nice for spring/summer or Easter, and with a change of colour could easily be adapted to more autumn/winter designs. Please excuse my cuticles, I am in dire need of a manicure, the five looks I came up with are five easy looks that anyone can do, and I say this because if I can do it, anyone can. I used 7 different pastel polishes (plus a black nail art pen from Primark for the chickens eyes) to create all these looks and the only tool I used was a dotting tool but you could use a cocktail stick or the end of a bobby pin/kirby grip if you don't have a dotting tool. First of all I applied Orly Bonder for my base coat, this is my holy grail base coat and the one I used for all the looks. I then applied 2 coats of Peachy Keen by China Glaze. I then took my dotting tool and placed lines of dots in different colours, I used Essie's Lovie Dovie, Essie Mint Candy Apple, Illamasqua Blow and Barry M Gelly Hi Shine in Prickly Pear. I used the Prickly Pear in the middle and matched the lines of spots either side, I finished with a coat of my holy grail top coat which is Orly's Glosser top coat. After applying my base coat I applied 3 coats of Essie's Mint Candy Apple then once that was dry I took my dotting tool and placed 2 dots of the Illamasqua blow and then placed 5 dots of the Lovie Dovie by Essie around them to create the flowers, I finished with a coat of Glosser. I applied 2 coats of my Rimmel French Rose polish, I always use this as a base for my french manicures, once this was dry I applied 2 coats of Prickly Pear by Barry M to the tip of my nail. Once the Prickly Pear was dry I used my dotting tool and Blanc by Essie to create the dots on top of the Prickly Pear, I finished the look with a coat of the Glosser top coat. After the base coat, I applied 3 coats of the Illamasqua Blow, and then took the Blanc by Essie and created the triangle effect at the tip of my nail, to do this I turned the brush side ways and first made the 'lines' then filled the tip of my nail in with the polish, I also used my dotting tool to create 2 white dots for the chicks eyes. Once the white was dry, I used my Primark nail art pen in Black to put 2 small dots of black on top of the 2 white dots for the chickens eyes. For the nose I used Peachy Keen and drew 3 small dots and then filled in the middle to create an upside down triangle that looked like the chicks beak. Again I finished the look with a coat of Glosser top coat. I applied 3 coats of Bikini So Teeny by Essie to my nail after top coating, and allowed it to dry. Once dry I used my dotting tool and placed dots around my nail using Blanc and Lovie Dovie by Essie and Blow by Illamasqua. I used both sides of my dotting tool to create smaller and larger dots. Once dry I finished the look with a coat of Glosser top coat. And that is how I created each look and which polishes I used, like I said you could use any pastel colours you have in your collection. 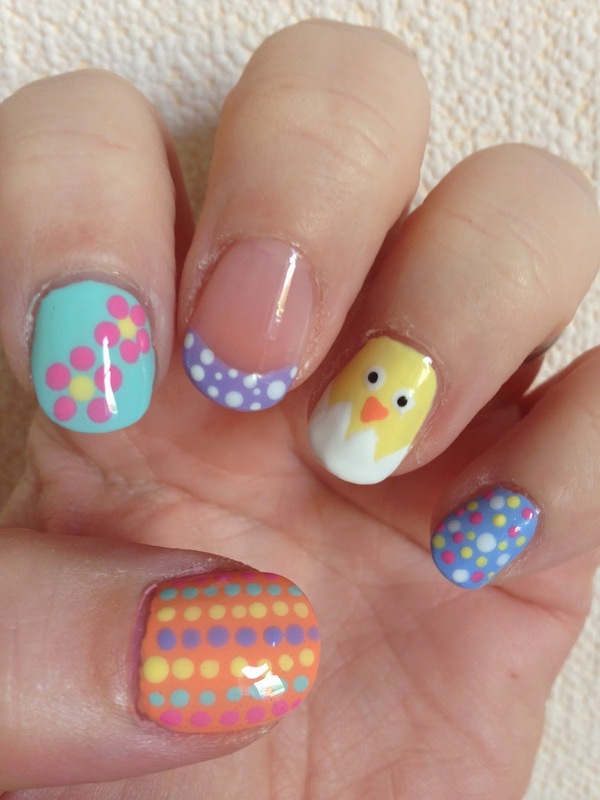 You could use any of the looks as an accent nail or for a full on Easter nail effect you could have 10 little chicks, I think the pastel spotty french manicure would look nice on every nail maybe using a different pastel shade on each nail and adding the white spots. If you would like me to create any more nail art or nail looks, please feel free to leave your suggestions in the comments or if you'd rather, I have clickable links of all my social media links in the squares at the top right of my blog of where you can contact me also. Please leave any comments or questions for me in the comments below and I will get back to you asap, I always reply to all my comments and questions.